The Olympics still hasn’t found gender parity in many events, including canoe. Here’s why. Katie Vincent is a natural athlete who loves to com­pete. A former downhill skier, the 20-year-old took up sprint canoeing as a kid and joined a canoe club in 2006. Today she is one of the best in the world at her sport, which combines strength, endurance, balance and the ability to maintain an intense focus. One imperfect stroke in this tippy 14 inch-wide boat and you’re in the lake. Katie Vincent competing in Racice, Czech Republic in 2016. 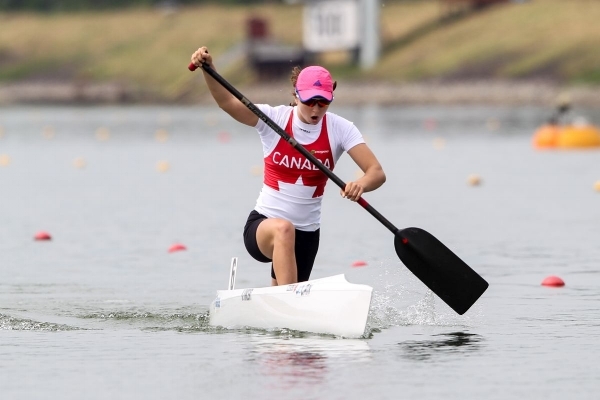 In 2016, the Mississauga, Ontario, native won gold at the International Canoe Federation (ICF) World Cup 1 in Duisberg, Germany, when she completed the Women’s C1 200m event in 46.205 seconds. She beat last year’s winner, another Canadian, Laurence Vincent-Lapointe, by 0.214 sec­onds. But you didn’t see either woman compete in the 2016 Rio Olympics. Yes, there are still events in the Olympics that do not have female divisions. Canoe is one of them. “I think there has not been a women’s canoe race in the Olympics because that was just the way things were,” says Vincent, who started competing seriously in 2011. It’s not just a matter of slipping in a few women’s races. A quiet war to see women’s canoe in the Games has been raging among athletes, activists, the International Olympics Committee (IOC) and the ICF for over 90 years. The core values of both the IOC and the ICF include reaching gender equality in canoe, but systemic sexism and red-tape are at the heart of the matter, and untangling the mess has been a long struggle. Vincent was a competitive downhill skier for most of her life. When she was 15, the prospect of women’s Olympic canoe was still only talk, but she followed her gut into the sport. Historical precedent may be part of the reason female canoeists like Vincent don’t have a place at the Olympics. Pam Boteler of Washington, DC, made USA canoe history when she raced in men’s events at the 2000 National Championships, taking gold in Intermediate Sprint C2 500m with Heather McNie and bronze in the men’s Intermediate Cl 500m. There is gender discrepancy in many Olympic events that seem arbitrary to the modern eye. In gymnastics, only men compete in high bar, parallel bars, pommel horse and rings. Only women compete in uneven bar and balance beam—though not always. Women used to compete on the rings and parallel bars. Pam Boteler in 2000 with C2 partner Heather McNie after winning gold at US Nationals (Men’s class), the first time women were allowed to compete. The events were split up to showcase the perceived natural ability of each gender—men’s upper body strength and women’s leg strength. Arguable, but at least logical. Other events, like running and skiing, are split down the middle. Athletes compete against members of their own gender, but the events themselves are the same: A 200m race on the track, a volleyball game, an ice hockey game. The Olympic sport called “canoeing” actually encompasses both canoe and kayak events. So technically there are women in “canoe.” The ICF represents both sports, and while both take place in a boat, that’s where the similarities end. Canada introduced canoeing to the Olympics as a demonstration sport in 1924 in double-blade and single-blade format. By the time canoeing officially entered the Olympics at Berlin in 1936, the boats for double-blade paddlers had been redesigned to look more like today’s closed-deck kayak. Single-blade paddlers, then and now, kneel in open-deck canoes. According to Boteler, the sport name “canoe” was kept despite the changes as a marketing strategy. Today’s athletes are pushing to rename the sport “canoe/ kayak” for clarity. On the Rio 2016 website, kayak and canoe events are still listed under “canoe,” though they are sepa­rate events—canoeists and kayakers don’t race against one another. If you visited the “canoe sprint” page, you’d also find a listing of female medalists. But they actually medalled in kayak. It might seem a minor classification quirk, but the fact that female kayak medalists are listed under the “canoe” label obscures the fact that there is no women’s canoe event. Without an intimate understanding, you might think you could buy a ticket to the women’s canoe race—you can’t. Or that there are female Olympian canoeists—there aren’t. Pam Boteler racing with Itzel Reza at the Pan American Championships in 2010. Boteler says gigantism is a red herring. In 2015, the University of Toronto’s Centre For Sport Policy Studies released a gender audit for the Games. In it researchers report that “the main impact of ‘gigantism’ lies in the overall number of accredited persons, including media, ‘Olympic family,’ sponsors and VIPs.” At the London 2012 Games, that number was reportedly 510,000 people—that’s over 48 times more accredited persons than athletes. The money being spent on their lodging, food and secu­rity draws funds away from athletes and potential athletes, such as women. The ICF’s 2020 proposal for women’s canoe in Tokyo includes three events for women: Two sprint events and one slalom event. To make them fit, events were cut from the men’s program, a decision that had mixed reviews. Detractors argue female canoeists are not skilled enough to compete or entertain an audience and that inclusion could damage the already precarious renown of the sport. Others are taking it well. “I am so impressed and humbled by the way my teammates are reacting and adapting to these changes, it inspires me to do my best,” says Vincent. Despite all this, women’s canoe has developed at a record pace over the last 10 years. “We now have over 50 countries with women canoeists, events at the World and continental levels, rapid dropping in race times, and a dramatic reduc­tion in the time differential between first and last in the A finals,” says Boteler. It’s a self-fulfilling prophecy. As children, athletes train in both canoe and kayak. It’s not until around age 12 that they choose which sport they’d like to pursue. If you, as a woman, had Olympic dreams, which option would you take? The IOC will vote on the ICF’s 2020 Tokyo women’s canoe proposal this fall. It is considered a shoo-in by many. So women who love the sport may yet find a way to pursue it with the support they need. For her part, Vincent hopes to compete in Cl 200m and C2 500m.